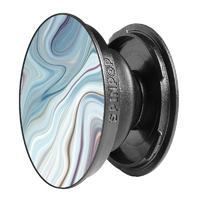 Grip your phone easily using SpinPop. SpinPop pops out when you need to use the grip or kickstand, and locks back flat when you do not. Use SpinPop to organize your earbuds and more! 1.6" x 1.6" x 0.5"